This is it: our last Parking Madness match-up before the Final Four. And it’s going to be a good one. From the beginning, the two cities facing off today — Cleveland, Ohio, and Tulsa, Oklahoma — both seemed to me like solid contenders to make the final rounds. Not pretty! 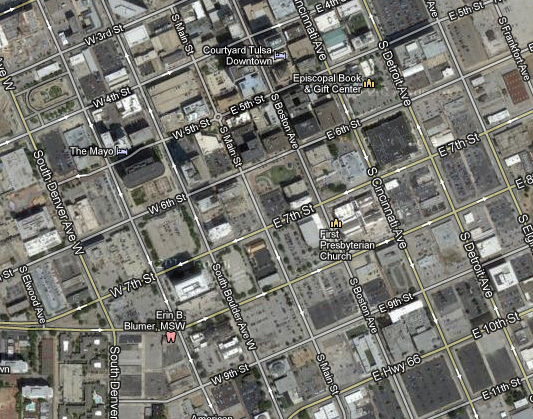 The good news is, Tulsa recently issued a moratorium on downtown surface parking lots. So there’s that. Now, let’s see how Cleveland stacks up. This animated gif shows Cleveland’s Warehouse District in the 1970s — when it really was warehouses — versus today, now home to apartments, dance clubs, and restaurants. The images were first published on my urbanism blog Rust Wire and assembled this handy way by an anonymous internet do-gooder. That second picture really shows how disruptive this crater is to the urban fabric. Let us know which one you judge to be more terrible. The winner will join Dallas, Houston and Milwaukee in the Final Four. 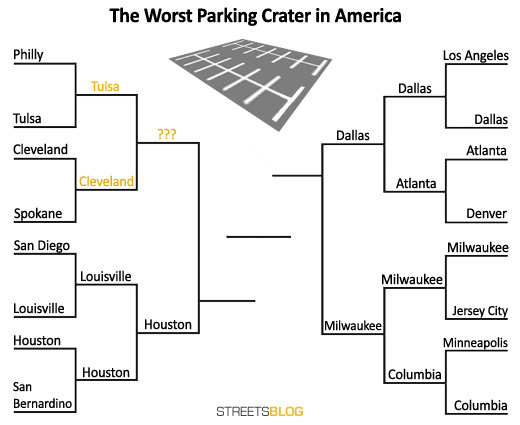 Which city has the worst parking crater? Isn’t Tulsa the Corbusian ideal? Towers in parks? If they were taking bets in Vegas, my money would be on Tulsa to win the whole thing. Check out the google streetview of downtown Tulsa and you will find virtually no human being on any of the downtown sidewalks. Cleveland’s crater is much sadder, in my opinion, all things considered. But I had to go ‘with’ Tulsa for today’s vote, though, since the desolation is just astonishing. I’m not sure if Tulsa’s counts as a parking “crater”, which implies that it’s surrounded by something other than more parking. 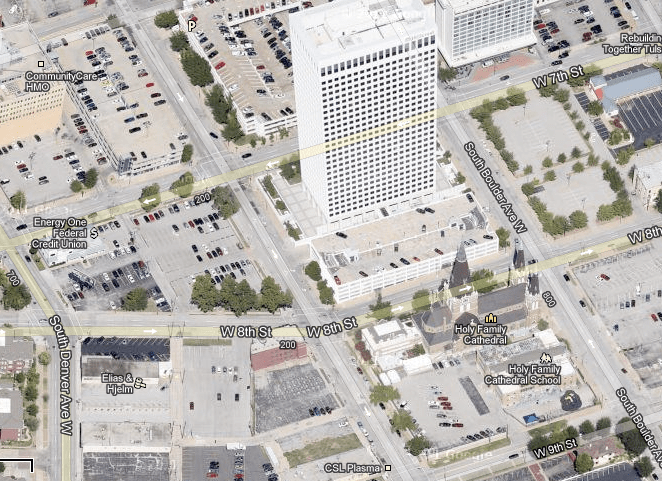 Looking at that second overhead shot, if you didn’t know better you’d think downtown Tulsa had been wiped out by a tsunami. Would love Cleveland to “win” to make a point to our leadership… But damn, Tulsa. I still say Columbia wuz robbed…. Ha. Everyone in Cleveland has pretty much conceded to Tulsa. The end of a dynasty! I thought our animated gif would give us an edge! Ha! The city of Cleveland never wins anything…not even here. I remember an article that I read a couple years ago– perhaps someone can help me find it again. It concerned an Art Deco ~10 story building in Tulsa, or some other city in the midwest, which had been abandoned for some time. A developer proposed restoring it, but the plan ultimately faltered because it didn’t have parking. If anyone can tell me what building that was, I’d appreciate it. Sounds like the Tulsa Club Building- but I don’t recall hearing anything about parking scuttling the project. I work in Tulsa at 15th & Boulder. My small 15 story building has 15 lots with 54 spaces each for it…….one large parking structure would eliminate all this dirt covered with asphalt. Tulsa needs ten times more Downtown parking than it has now. The City complains that there is not enough happening at the center of the City. I’m all for doing whatever for more parking and tons more free parking not matter how ugly people think it looks! There are no parking minimums in Tulsa’s CBD zoning, but that hasn’t stopped historic downtown buildings from being razed for parking. The daily paper tore down a Bruce Goff-designed building and replaced it with a dozen or so parking spaces in 2004. The local community colleges and several of the downtown churches have converted blocks of land for surface parking. Question is, does it make sense? You’d have to spend millions of dollars on the parking structure– and what will you have to show for it? Freed-up land you can use for new buildings– but those buildings will need additional parking structures, and cost millions of dollars more, and then you may end up with traffic problems as well. It may not pencil out. Successful downtowns work when the higher land prices and building costs are offset by reduced need for parking (if people take transit), better connections to everything else in downtown (because it’s close enough to walk to), and better transit (because transit is efficient when a large number of destinations can be served by one or two lines). If you build a dense downtown but expect everyone to drive, you end up with the worst of all worlds: a large need for expensive parking, high costs, and terrible traffic to boot. In that situation, you may be better off just leaving it as parking lots. From the aerials it looks like Tulsa ‘wins’ over Cleveland. If public transportation was good in Tulsa, there wouldn’t be such a need for cars. Plus, Tulsa and Tulsa County is so spread out, and still gaining area, that city bus travel is a pain ~ schedules cannot be relied upon in many cases, either. I prefer parking garages over parking lots in order to prevent rainwater run-off to the Arkansas River. 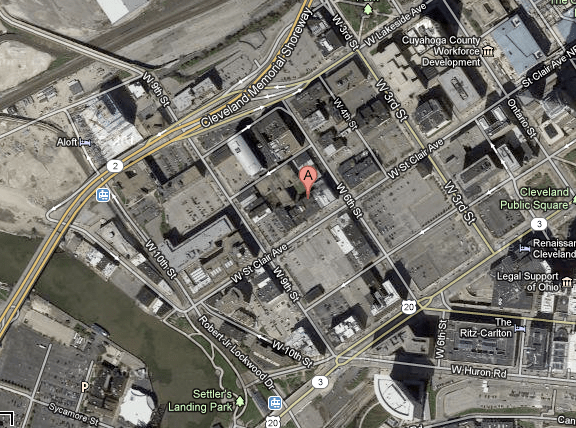 More “green” space is badly needed in Tulsa downtown. check out the street view of downtown Tulsa in real time and you will find an incredible turn around in the 8 years I have lived here. The urban renewal of the 70’s annihilated large sections of the downtown area taking with it all the small brick buildings for loft living and cheap rent for small businesses. I live right next to this wasteland (in Tulsa) in an inner city neighborhood that has been working hard to change things for over a decade. The walk into the core of Downtown is the most depressing of any city I’ve ever encountered, anywhere on the planet. (I’m writing this in London, where walking is a pleasure). Encouragingly, a number of those redundant parking lots have weeds poking through, so nature might eventually reassert itself if humans don’t fix it. Good ol’ boy resistance to progressive policy-making – land use policy and investment in mass transit mainly – is strong, and often bound up with a toxic, ideological thread. Coupled with a several decades fixation for investing tax dollars in auto-centered infrastructure in the ‘burbs, the prospects for curing this urban disaster anytime soon are bleak. It may well be that one.